This past Friday night, I had the privilege of witnessing a key moment in the growth of a central Ohio band. 90’s Kids are undeniably a pop group. Yet, watching their show brings to mind a certain punk sensibility. Not in the sound. But in the energy and grit. Indeed, if we were listening to their songs at face value, punk would be the furthest thing from my mind. Yet, Landen G from Something Else (who kicked off the evening) brought the punk comparison to my attention. And he was one of the group of folks chanting “Adeline! Adeline!” sidestage. This song is a synthpop earworm in just about every sense of those words. And it was a fitting encore, performed in in the band’s colorful jackets they wore in the music video for said tune. 90’s Kids only formed a short ten months ago and have accomplished a feat few Columbus locals can do—selling out a 200-capacity room their first year. “Now,” you might be thinking, “they probably packed out the bill with complementary bands with a solid pull in Columbus.” The aforementioned Something Else certainly had their group of superfans singing along, but it was nothing compared to the deluge of family, friends, and fans that 90’s Kids brought to the table. Supporting acts, Telehope and Golds, both were new to playing Columbus, as far as I knew (more on them in a bit). All of this to say, just about single-handedly selling out a 200-capacity room as an unsigned local artist is a feat in and of itself. This wouldn’t be possible if the band didn’t have the goods to back it up. As I mentioned earlier, they write shimmering earworms. And they give a compelling performance. They have a likability as people that overlaps with the cheer of the songs. And they put forth a polished, high energy performance at Big Room Bar with no house lighting, save for the soft glow of sidestage stringed lights and their own LED bars that they programmed. Frontman Corey Mouch was liberal with expressing his gratitude to the crowd and frequently perched on a monitor at the front of the stage, balancing himself with one hand on the marquee above. Something Else kicked off the show with some old fashioned rock, entertaining the more dedicated fans who arrived early. I noticed some young fans that appeared to be more in the pop realm (just guessing, from the Vesperteen tees) getting into it. Although Something Else is sonically nowhere near hair metal, I have to give them a shout out for that look. But if mid-tempo rockers are your jam, check these dudes out. Golds was a duo that was completely new to me. I didn’t know until after the show that they were from Chicago. They have a sound that isn’t quite as polished as 90’s Kids, but they certainly show promise. They penned some catchy hooks and powered through their set with enthusiasm. Continued hustle will bring them more and more fans, for sure. They have the right foundation! Telehope I was excited to check out because of a certain Bob Prenger—known around Tuned Up for running sound at our Donato’s shows and Steadfast Festival and perhaps known to some of you as merch guy and jack of all trades touring with Vesperteen. 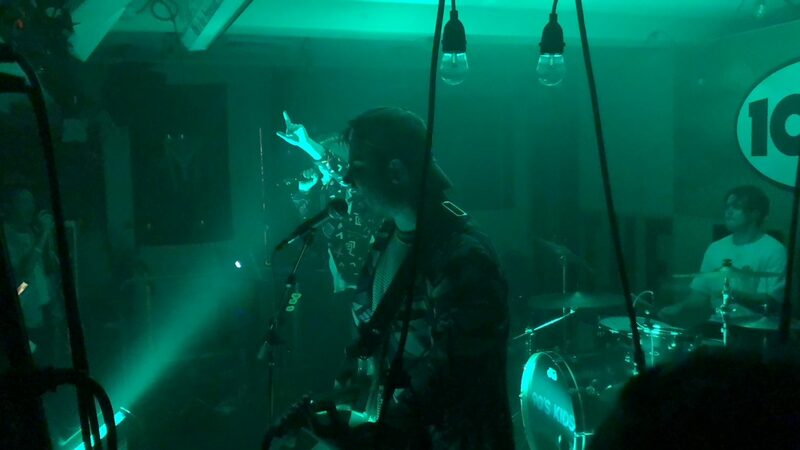 Telehope is blowing up in their hometown of Cincinnati, and this show made it easy to see why: again, more catchy tunes. Yet they had a certain poise and confidence about them, and their set had a very natural flow to it. All in all, this was a worthwhile way to spend a Friday night. Lawrence and Joe Hertler bring the heat to a new Nashville venue!